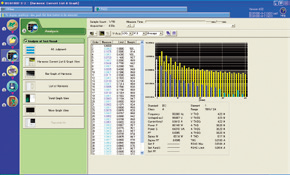 The Harmonic Analysis Software (Model 761922) loads data measured by the WT3000E and performs harmonic analysis that complies with the latest IEC61000-3-2 & IEC61000-3-12 standards. The harmonic measurement software also performs harmonic measurement tests conforming to the latest IEC 61000- 4-7 (window width is 10 cycles of 50 Hz and 12 cycles of 60 Hz) with WT3000E. Enables PASS/FAIL evaluations of harmonic measurement results in line with standard class divisions (A, B, C, D). It displays lists of measurement values, as well as bar graphs that allows users to compare the measured value and standard limit value for each harmonic component. Three modes are available for harmonic measurement. To view current, voltage, and phase angle for each order in a bar graph. To view measured signals to confirm the suitability of the range and other factors. To conduct standards tests and to make the necessary judgments. 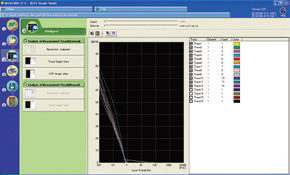 Efficiency is gained by performing tests after checking the waveform in Observation mode. This function enables voltage fluctuation and flicker measurements in compliance with the latest IEC61600-3-3 & IEC61000-3-11 standards to be carried out. 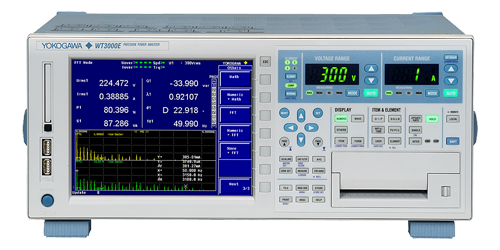 *The WT3000E enables user to perform tests for flicker measurement. Also by using the 761922 harmonic/flicker measurement software, it is possible to display trend graphs, Cumulative probability (CPF) graphs, or reports of the dc, dmax, and Instantaneous flicker sensation (IFS) values in addition to the WT3000E evaluation results.